Natroy Longstroth Richards was the seventh child in a family of eleven children. Her parents and family were baptized on March 4, 1838, by Heber C. Kimball and Orson Hyde and were some of the first fruits of L.D.S. missionary labors in a foreign land. The family had much to endure because of this. While in England, and when they left there, they had to give away most of their possessions, but they did keep one feather bed for the mother's use; she being an invalid at that time. They buried their two eldest daughters in England and the other children were deprived of schooling. I have heard my mother (Nanny) say she had but six weeks in school but she acquired a knowledge of the use of good English and spelling and was apt at figures. She was a fine executive. When she was eight years of age she was present at the coronation of Queen Victoria of England, who was but eighteen years of age at that time. Nanny, with her family, left England when she was twelve years old. It took six weeks to make the voyage from Liverpool to New Orleans, going from there up the Mississippi River to Missouri. When seventeen years of age she was married to Doctor Willard Richards by the Prophet Joseph Smith in the Nauvoo Temple. She was a plural wife. She remained with her parents for two years and with them went to St. Louis, Missouri, where her father was obliged to go to earn a living for his family. He was an architect and builder, a master mechanic who helped to build two Temples. While Nanny was in St. Louis she lived with a wealthy family who wished to adopt and educate her as they had no children and not knowing that she was a Mormon and married. They paid her well and gave her many beautiful presents, some of which are still in existence. While in St. Louis, she earned money with which she bought linen to make a Temple suit, believing that she could never get any here. I now have the robe which I wear in the Temple and it is in good condition although over eighty-two years old. Nanny, with her family, passed through the persecution of Nauvoo and Missouri. When the Prophet and Patriarch were on their way to Carthage Jail, they drank at Father's well, as did the mob. Nanny was there and often spoke of the feeling of gloom which all of the Saints felt. Her husband, Willard Richards, was with the brethren in Carthage and was the one there who did not receive a wound. When the mob fired on the city, Nanny's brother William who was four years old, brought in a cannon ball that was so hot it scorched his apron. Nanny was at the meeting where the mantle of Joseph Smith fell upon Brigham Young, and she testified that it was marvelous and so plain that all who saw it knew that Brigham Young was the man to lead the Church, and the Saints to the Valley of the Mountains. Patriarch John Smith told Nanny in a blessing which he gave when she was sixteen years old, "that prophets, seers and revelators, should proceed forth from her." This prediction was fulfilled. 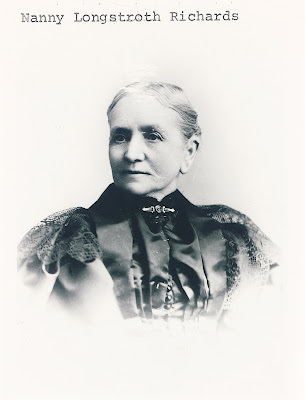 She is the mother of Apostle George F. Richards, who is also President of the Salt Lake Temple. She is grandmother of Apostle Stephen L Richards, and she was the wife of two apostles. After the death of Willard Richards, who was also counselor to Brigham Young, she married his nephew Franklin Dewey Richards, who was President of the Quorum of Apostles at the time of his death, Dec. 9, 1899. She was twice widowed, first when twenty-six years of age. At this time she had two daughters and one son, the baby being but seven months old. His name is Stephen Longstroth Richards and he is the father of the present Apostle Stephen L. Richards. The daughters were Alice Ann (wife of Lott Smith), and Mary Asenath (wife of Joel Grover). Nanny crossed the plains in the fall of 1848 with her husband, her parents and their families. On March 24, 1849, her eldest child was born in a wagon on south Main Street in very cold weather. Willard Richards died in 1854. On March 6, 1857, Franklin Dewey Richards, my father, married four of his Uncle Willard's wives, thus fulfilling the wish of the first husband and President Young's counsel that they marry again to have a protector and provider, and that they might raise up a posterity to his name. I am the eldest of the three children born to Franklin Dewey Richards and Nanny L. Richards, George F. and Frederick W., being my brothers. Nanny was one of the last to leave Salt Lake City to go south at the time of the Johnston Army invasion. I was then two weeks old. 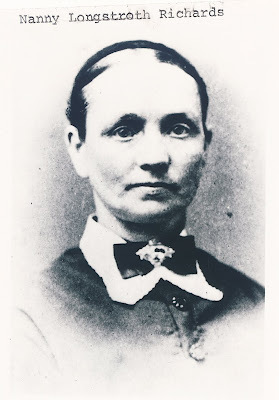 She, with her four children (one being very sick) and three of her deceased sister Sarah's children, and one other, lived in a shanty under the same roof with three other families while in Provo. On their return home they knelt and thanked the Lord for their deliverance. In the year 1860, Franklin Dewey Richards moved his four families to Farmington. The four wives lived on the same block and all in harmony and love. He owned a flour mill in Farmington called the Rock Mill which gave us our bread, also chicken and pig feed, which the older children carried home upon their backs. The children also hauled float-wood from the pasture, and brush from the mountain side. Oh, we were poor enough! Bread and molasses tasted good to us then. After arriving in Utah, mother made molasses out of beets. She boiled her soap in a big brass kettle which we owned and I remember a huge furnace, we called it, which we used to hold our wash water after carrying it in buckets. We also used it to wash our carpets and cool our soap. Mother let me help make tallow candles and I felt quite grown up. Also spinning, carding wool for quilts, making rag carpets, under which we put fresh straw twice a year at house cleaning time. She raised her own pork and cured it herself, using a large barrel filled with salt brine. She smoked the hams and shoulders. She colored her own yarn for clothes with indigo, madder, etc. She did much of her sewing by flickering candlelight. No wonder she suffered so much with her head and eyes in later life. Nanny and her sister Sarah, who was the mother of Sarah Ellen Richards Smith, were both wives of Willard Richards at the same time. They were very nearly the same size, small but very capable and industrious. They had one layette for their babies, and one dress to go out in, and whichever one went used the dress and baby clothes. They were happy to be so fortunate as to have one good outfit. When Nanny was about forty-nine years old, she had a very severe and prolonged illness. She was in bed most of the time for two years and was an invalid for several years more. She raised three of Sarah's children after Sarah's death. They are Willard Brigham, Joseph Smith and Sarah Ellen. Pauline, the youngest, made her home with her Aunt Alice Watt, and was married from there. Nanny resided in Farmington until she was called to Nephi because of the death of Joel Grover, May 14, 1886. He was the husband of her daughter, Asenath. The poor girl needed her mother more than all of them. Nanny made her home there, and years later when Asenath moved to Salt Lake, Nanny came with her where she died Jan. 7, 1911, in her eighty-third year leaving a legacy of a life well spent in the service of her family, who revere her memory and look forward to the time when, if we are faithful, we will meet her again and enjoy her company through all the eternities, please God. She had a perfect tithing record. Her last days were made comfortable and happy. She died with hope of a glorious resurrection. The blog and data is excellent and informative as well .